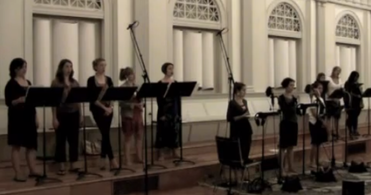 The Lorelei Ensemble in a recording session of A Single Decade Rosary. The works listed below represent a large portion of the composer's catalogue. Pieces are broken into categories of instrumental music (subdivided into solo/small ensemble and large ensemble works), music with voice (subdivided into chamber works and works for chorus/large ensemble) and music in the electronic medium (subdivided into fixed media pieces and pieces with performers.) Pieces for performer and electronic media are listed in both the instrumental and electronic categories. Several of the pieces have a recording that can be heard by clicking the link to the right of the piece's listing. If you are interested in obtaining a score or recording for any piece, please contact me at justin@jdcas.com. Click here for pieces published by and available for purchase through World Projects, Inc.
for percussion quartet (four tom–toms); 2015, circa 9’. for string quartet; 2014, circa 12’. for solo tuba; 2013, circa 10'. …and so the I threw the stone. for trumpet and live electronics; 2012, circa 10'. for flute, violin and harp; 2012, circa 9'. for flute and oboe; 2012, circa 7'. for brass quintet; 2011, circa 8'. for four-player percussion ensemble; 2011, circa 9'. for wind quintet; 2011, circa 14'. for flute, bass trombone and percussion (vibraphone and three toms); 2010, circa 9'30". for solo piano and live signal processing; 2009, circa 10'30". for viola and piano; 2008, circa 11'. for violin and fixed electronic media; 2004, circa 9'. for cello and piano; 2003, circa 6'. for flute, clarinet, horn, violin, cello and piano; 2002, circa 12'. Sitting in the House of a Giant - in memoriam G.S. for wind ensemble; 2016, circa 5'30”. for string; 2014, circa 12’. Click to purchase score & parts from World Projects, Inc.
for chamber orchestra; 2012, circa 9'30". for full orchestra (winds in 3's); 2008, circa 5'. for mixed ensemble (fifteen players); 2008, circa 7'. for string orchestra; 2002, circa 20'. for mixed wind ensemble 2002, circa 15'. for SSAA quartet; 2013, circa 9'. for soprano and piano 2009, circa 9'. ten short songs for mezzo-soprano and piano trio; 2001, circa 10'. for soprano and string quartet; 2002, circa 3'. for baritone and piano; 2002, circa 3'. for mezzo-soprano and piano; 2001, circa 3'. SATB a capella choir; 2015, circa 5’. Click to purchase score from World Projects, Inc. Traditional texts: Pater Nostre, Ave Maria, Gloria Patri. for SATB choir; 2007, circa 4'30". for electric violin, amplified piano and trap kit; 2000, circa 7’.